On the wall inside the front door, painted in bold letters, is the slogan “Made by families, not factories.” It’s an apt description of Room & Board’s business model, which embraces the fine craftsmanship of furniture making. Eighty-five percent of its exclusive designs are manufactured in America, and price tags proudly note where each piece was made—whether it’s a leather sectional sofa from North Carolina or a steel-legged dining table from Minnesota. The mix is modern, timeless, and, best of all, affordable. Sofas, for example, start at $799. One-of-a-kind accessories, such as vessels made from recycled glue or framed vintage museum banners, provide warmth and personality. 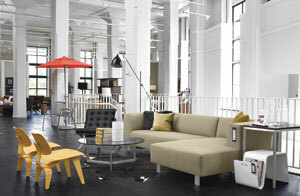 A few iconic brands, including Herman Miller seating and Artemide lighting, add extra style. Anchoring White Provision, a mixed-use development on the westside, Room & Board spans three floors and 34,000 square feet. Built circa 1910, the brick building housed a meatpacking factory, and there are original steel smoker shutters to prove it. Exposed ductwork, brick walls, and repurposed wood floors add to the industrial spirit. In fact, the revitalization is characteristic of the chain, as several of its nine stores are in historic buildings. By working directly with the manufacturers, Room & Board is able to offer quick turnaround, low prices, and seemingly endless options, says Lisa Durham, retail market manager of the Atlanta store. They advertise “any fabric, any frame” and offer two design centers on-site stocked with more than 200 fabrics and eighteen different tabletops. The Linear Custom Cabinet collection, priced from $799, allows customers to pick a shell, type of wood, style of hardware, and number of drawers and/or shelves. While the store doesn’t offer sales per se, it will host a clearance event in December, Durham says, to make room for new collections. But the best value has to be Room & Board’s white-glove delivery. The crew will unload a single item or an entire truck’s worth of furniture within the local delivery area for just $79. HOURS Monday–Friday, 10 a.m.–7 p.m.; Saturday, 10 a.m.–6 p.m.; Sunday, noon–5 p.m.
TAG LINE Classically designed sofas, chairs, tables, case goods, beds, and accessories with a modern edge.